Pulau Redang Archipelago (Pulau Redang and the surrounding islands) with its rich marine life, white sandy beaches and clear turquoise water, provides some of the best diving and snorkelling in the Indo-Pacific region. These pages contains information on our paradise. Guides and tips to help you plan your holiday with details on how to get here have been included. We are hopeful that this will encourage you to make our paradise your next holiday destination. 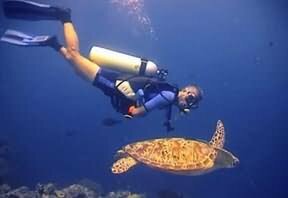 Information on scuba diving courses is also available. We seek your co-operation to conserve and care for our natural heritage. It is our fervent hope that these pages will help you play your part in addition to enriching your experience, enjoyment and appreciation of our islands during your stay. "The greatest wealth of animal life is to be found in ....Indo-West Pacific. The faunistic centre of this regions is the Malay archipelago. The Indo-Malay archipelago....(It is) therefore not unexpected that an abundance of animal forms should have developed here, no region in the world being so rich in species." Larry Lam is a PADI scuba diving instructor. He also works as a tourist guide, registered with the Ministry of Tourism Malaysia. Stamp Gallery - Malaysian postal stamps featuring marine life. Aquatic Adventure Divers' Log - articles on diving and Redang. Join the fun and adventure! Enrol for your open water diver course. E-mail our instructors for advice and suggestions. Last updated: 23rd June, 2009.